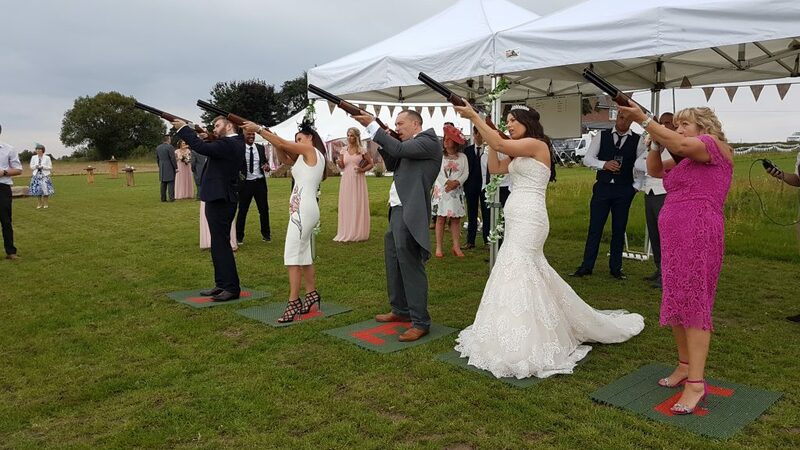 Why not have something different at your wedding ~ CLAYZER laser clay pigeon shooting is an ideal form of entertainment to have at your wedding with all guests being able to take part. Provided the venue has the space then why not give them something to do during those 'quiet' times. 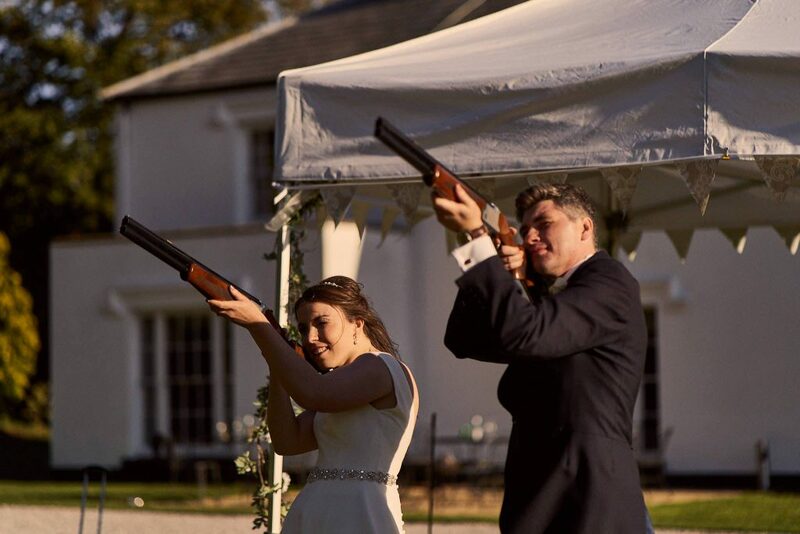 We only do laser clay pigeon shooting and because of our experience we ensure our clients get the very best for their guests. 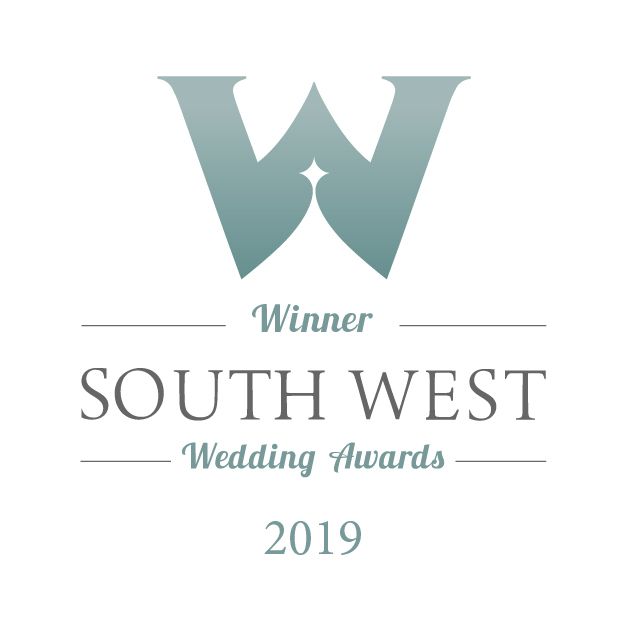 We are very proud to announce that for the second year running we have been honoured by the judges as the 'Judges Choice' in the South West Wedding Awards 2019 as initially voted for by our past clients. At the bottom of the page are the comments submitted by some of our clients to the award panel. We will work with you to make sure you get the best of our time on that most special of days. 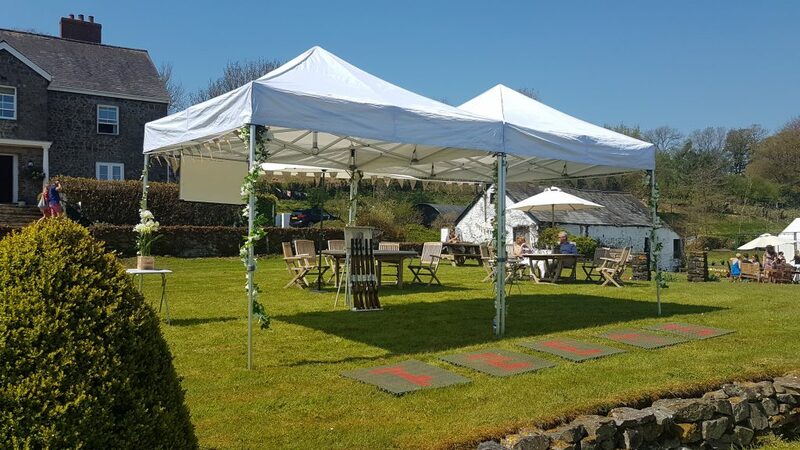 CLAYZER is operated under a 6m x 3m marquee, which is 'dressed' with flowers and bunting for your special day, so your guests have shade in the sun and are kept dry should the weather be inclement. **New in 2018** We changed our look for weddings and now provide a white canopied marquee and bunting is now a 'rustic' hessian. 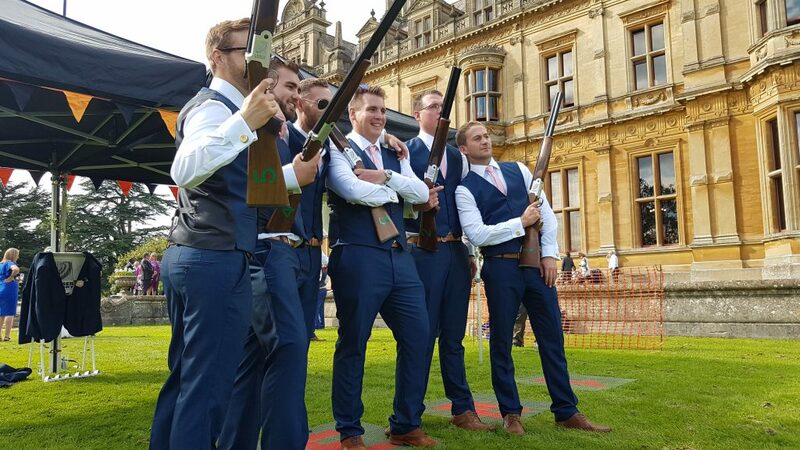 Our instructors now wear beige chinos, white shirts and and tweed waistcoats to compliment the occasion. At 'exclusive use' venues or if time allows give the men or your guests something to do in the morning whilst the ladies get ready. After the ceremony and before the wedding breakfast during that quiet time when the happy couple are having their photo shoot. After the wedding breakfast and into the evening for all your guests. Or even the day after before everyone leaves. Chris of Clayzer was fantastic. We heard nothing but praise from all our guest in regards to choosing Clayzer as our afternoon entertainment. In my opinion it provides far more value than other typical entertainment choices at weddings we had previously attended. Couldn't have asked for a better activity for our wedding day, everyone from children to the elderly LOVED it!! Clayzer couldn't have been more accommodating and friendly!! 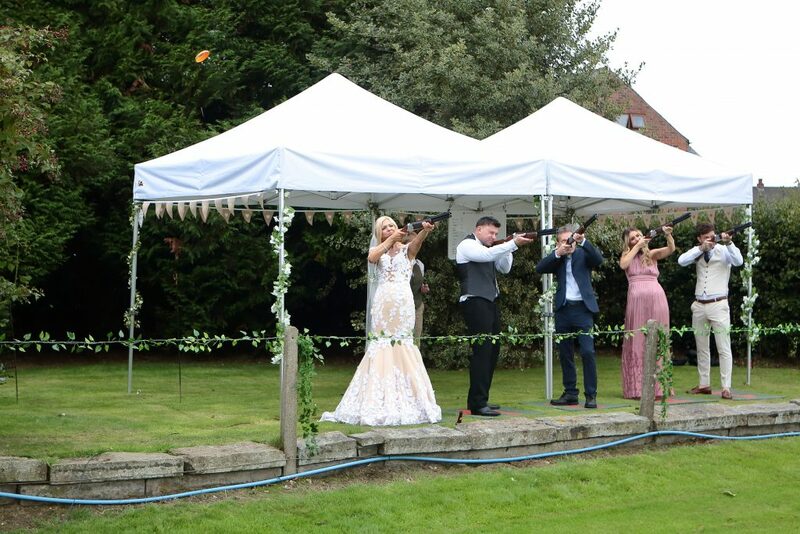 Fantastic addition to our wedding, Chris and the team were extremely professional, the wedding would not have been the same without Clayzer being there and people are still talking about it 5 months later! Really great fun. Excellent service. Took time to help younger members of the group to join in so that all had a great time! 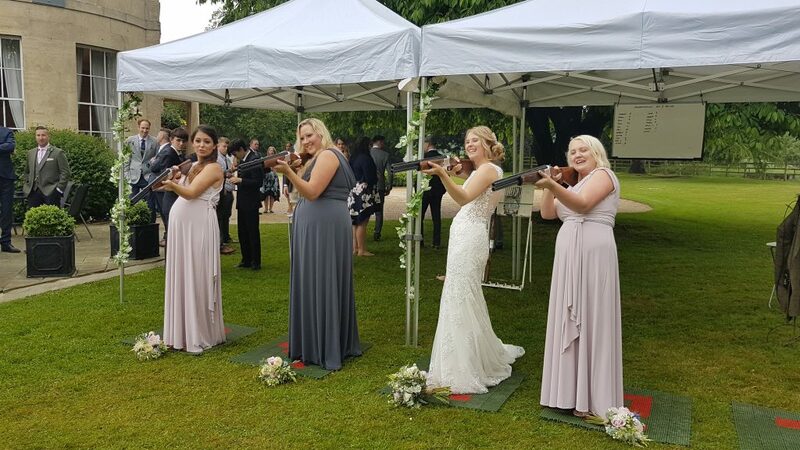 Using Clayzer was the perfect start to our wedding!! Chris & Team from Clayzer were absolutely amazing during our special day and they made the process so simple. They made everyone feel very welcome and got people involved. All our guests commented that they had so much fun and it was a brilliant experience. I would definitely recommend Clayzer for an event. The customer service in the build up was superb and we felt in very safe hands leading up to the day On the day itself they were very professional and integrated well with family and guests. They were used for the entirety of the time we had them. Although it would have been enough to just stand there and shoot Chris thought of brilliant games to compete against each other and everyone really enjoyed it. On a personal note we had an extremely ill family member who thoroughly enjoyed Clayzer and it was an absolute delight to see them enjoy it so much. So a huge thank you to Chris and his staff for contributing to our amazing day. Chris was exceptional prior to our wedding, and all the day was even better. Chris showed up on time, got set up and got all of our guests involved from the start until the end of the day. Everyone loved the game, and said it totally made our day every better. 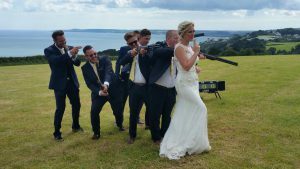 I would certainly recommend Chris and his Clayzer for anyone looking for a bit of fun on their wedding day.